This bow is great for Baby Bows and Matching Ponytails. This is a smaller size bow that is attached to a lined alligator clip. 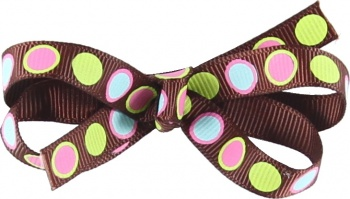 It has lime, pink, light blue polka dots in a row on the chocolate brown grosgrain ribbon. These colors will match any outfit due to all the vibrant colors in this bow.